Personaggio - Canaglia - Leader. Punti: 14/18. Salute: 12. You can include up to 2 villain cards and up to 2 hero cards in your deck (following other deckbuilding restrictions). 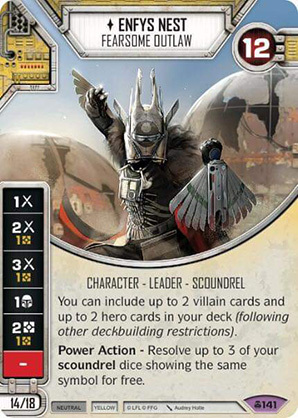 Power Action - Resolve up to 3 of your scoundrel dice showing the same symbol for free.